Industry leaders voice serious concerns about the future implications for saltwater fisheries management. ALEXANDRIA, Va. – The Gulf of Mexico Fishery Council recently voted 10-7 to approve Amendment 40, also known as sector separation, which would divide the recreational red snapper quota between individual recreational fishermen and charter/for-hire captains. The American Sportfishing Association (ASA) is strongly opposed to sector separation and is deeply troubled that this poorly conceived and detrimental plan was passed by the Gulf Council. In its 2013 position paper on sector separation, ASA urged federal fishery managers to remove saltwater recreational sector separation from all management plan discussions. 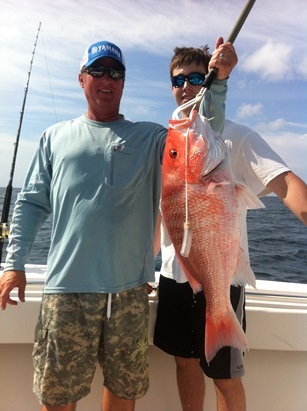 ASA believes that sector separation will create serious conflicts between private anglers and charter/for-hire captains, and further diminish recreational fishing opportunities for red snapper. Earlier this year, a landmark report produced by the Commission on Saltwater Recreational Fisheries Management presented a new paradigm for conserving marine fishing resources while producing the full range of saltwater recreational fishing’s economic, social and conservation benefits. A Vision for Managing America’s Saltwater Recreational Fisheries outlines the nation’s most important recreational fisheries management issues and is intended to help guide federal policy decisions. A small glimmer of hope for the future of recreational management of Gulf red snapper was provided by a last minute attachment to Amendment 40 that requires a three year “sunset,” which means that unless the Council takes action to continue sector separation it will expire after three years. This provision was introduced into the discussion once it became evident that the permanent sector separation proposal had the votes within the Council for passage. While sector separation is now scheduled to go into effect for up to the next three years, the sunset provision stops any forward movement on bringing catch shares into the temporarily separated recreational sectors and prevents a permanent implementation strategy. In addition, the five Gulf states (Texas, Louisiana, Mississippi, Alabama and Florida) agreed on a path forward for regional management (formally known as Amendment 39) that would give each state control over the recreational fishery off their coast, in both state and federal waters, in a way that better meets the needs of the recreational fishing community. “The most important and valuable action at the Council level for the sportfishing industry is to support the states’ efforts to develop a regional management plan as quickly as possible and to help ensure that it be implemented prior to the sunset of sector separation,” said ASA President and CEO Mike Nussman. The states’ big stumbling block was how to divide the allowable catch among the states. However, the states agreed to an allocation formula during the meeting, as well as a timing strategy for implementation. This gives the Gulf states a strong incentive to agree upon a regional management structure by the time sector separation expires.